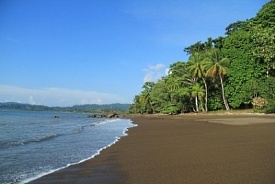 Puntarenas is located in the central region of Costa Rica's Pacific coast. With a population of 100,000, it is the capital of the province of the same name. Flat, dark-sanded Jaco Beach is a popular seaside locale and surfing spot. As with the rest of the country, a wealth of nature attractions is accessible from Puntarenas. Don't miss the delicious seafood available everywhere, from typical diners called "sodas" to more formal restaurants.